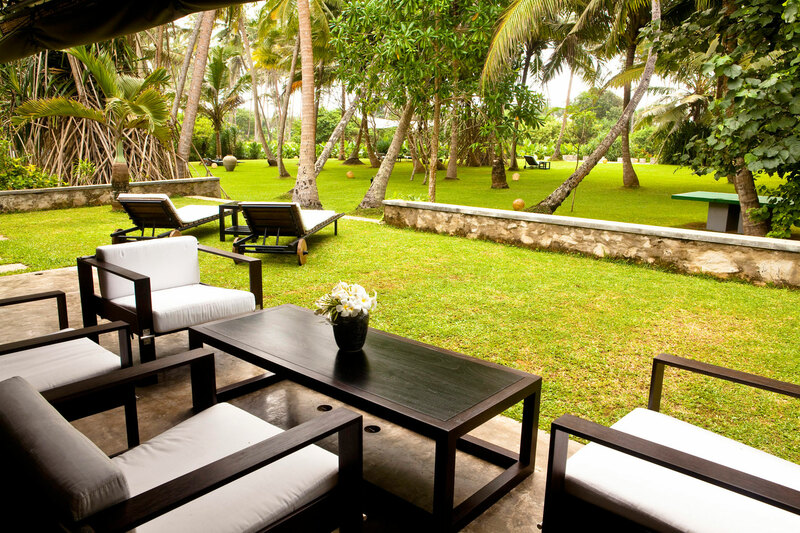 Bogenvillya is a lovingly maintained oasis of relaxation, situated in a tropical garden with direct access to the beach. 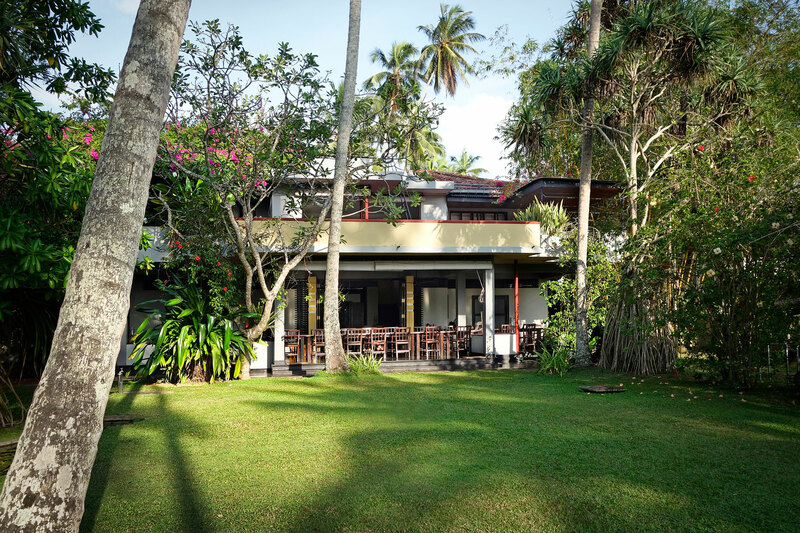 We welcome you to our Ayurveda Guesthouse & Resort Bogenvillya. 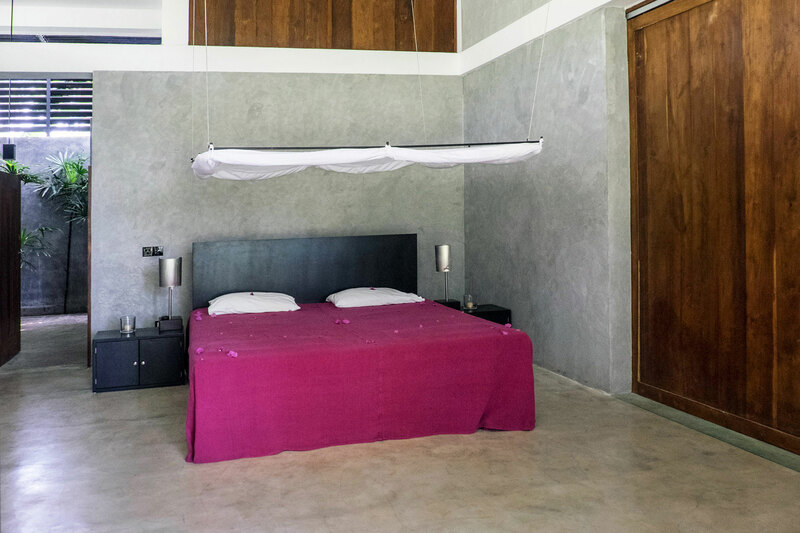 It is located 80 km south of Colombo on the west coast of Sri Lanka on the Ahungalla Beach, and is harmoniously nestled in the coastal landscape in close proximity to the fishing village Ahungalla. 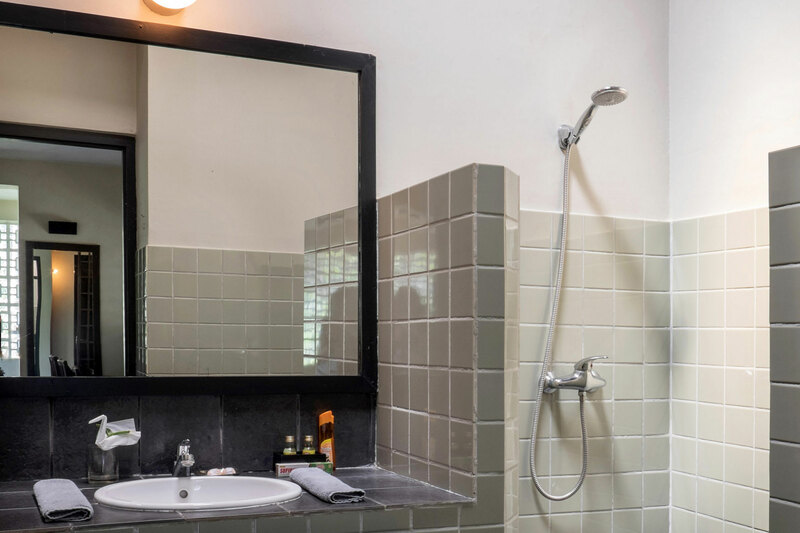 In the middle of a generously landscaped garden with a lagoon, palm trees, small fish ponds, lush tropical vegetation and a swimming pool, as well as direct access to the sandy beach, the Bogenvillya combines recreation in a family atmosphere with the amenities of a comfortable resort. 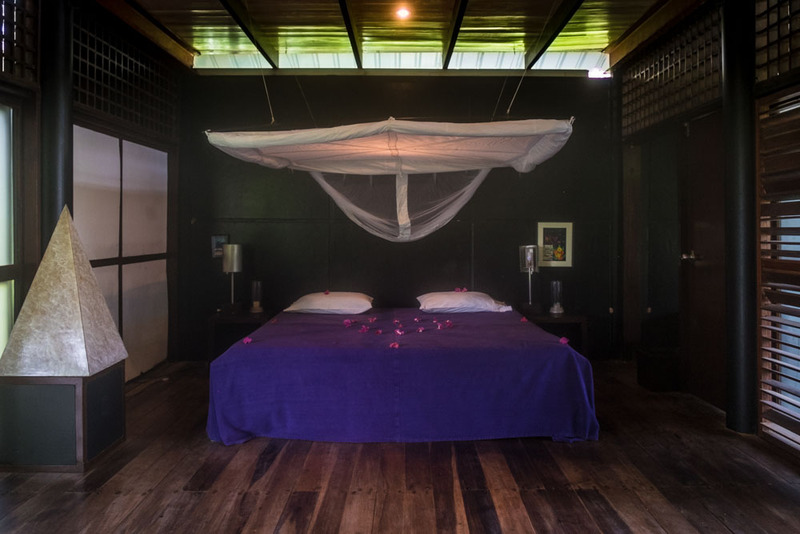 During your stay, we will look after your physical and emotional well-being with an individual range of Ayurveda treatments, yoga lessons and balanced, predominantly vegetarian cuisine. 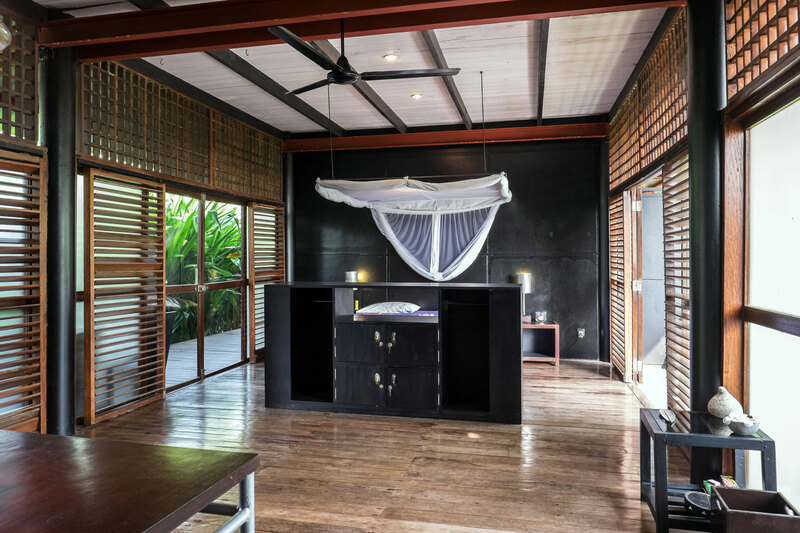 Our Ayurveda physician, our trained Ayurveda therapists, and our friendly, experienced staff ensure that you will always feel completely at home with us. 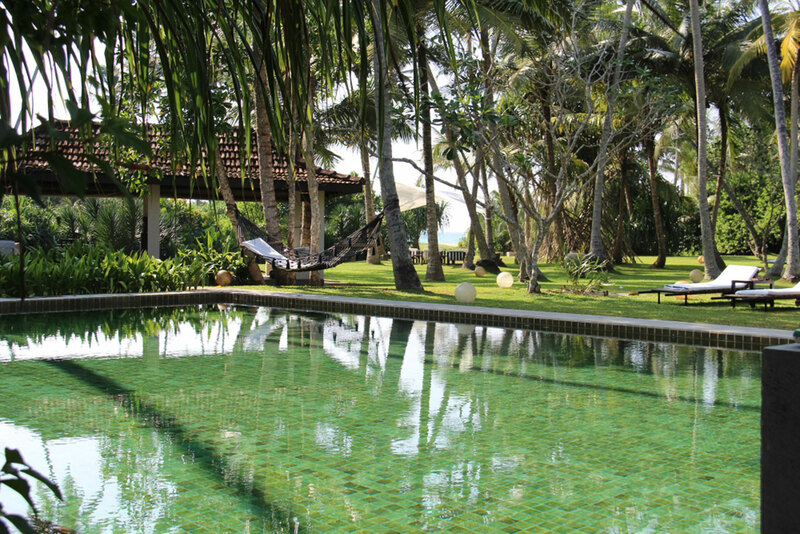 Sri Lanka, where the epic of Ramayana is said to have taken place, still today exudes a certain mysticism. 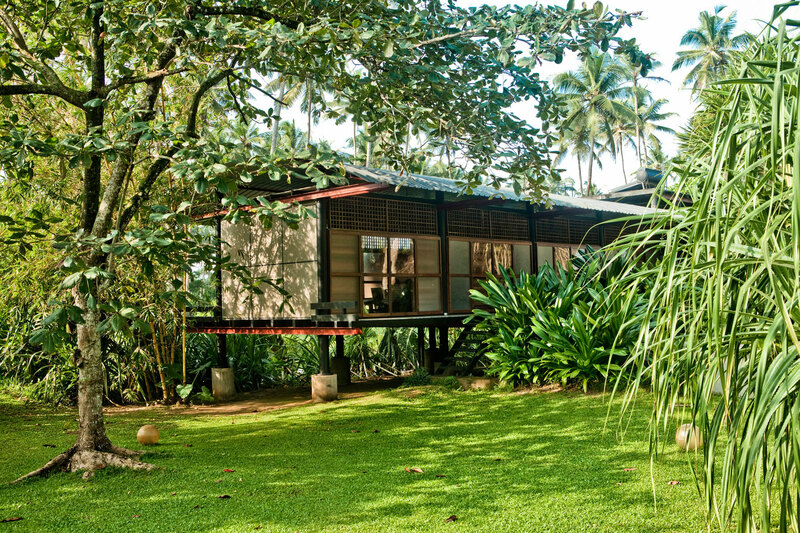 Here, on the island’s southwest coast, visitors can instantly recognise why this island is called “the pearl in the Indian Ocean”: The Ayurveda Guesthouse & Resort Bogenvillya is located in the midst of mangroves and palm trees near an original fishing village on the kilometre-long sandy beach of Ahungalla. 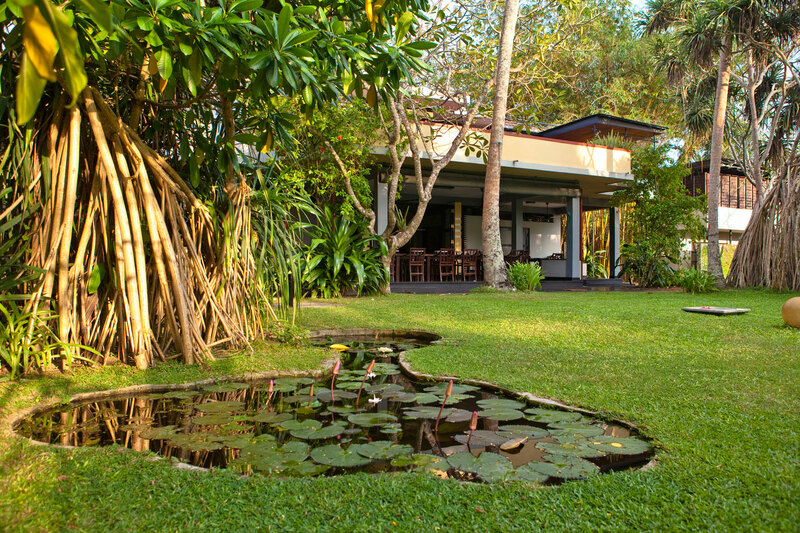 Surrounded by numerous temples, the location offers an exceptional cultural and nature experience. Ahungalla is an ideal starting point to explore the centuries-old history of the island and its many different cultural as well as religious influences. The railway, built during the colonial era, traverses the rain forest and leads directly from the capital Colombo to Kandy, where Buddha’s tooth – the holiest relic of Buddhism – is preserved. 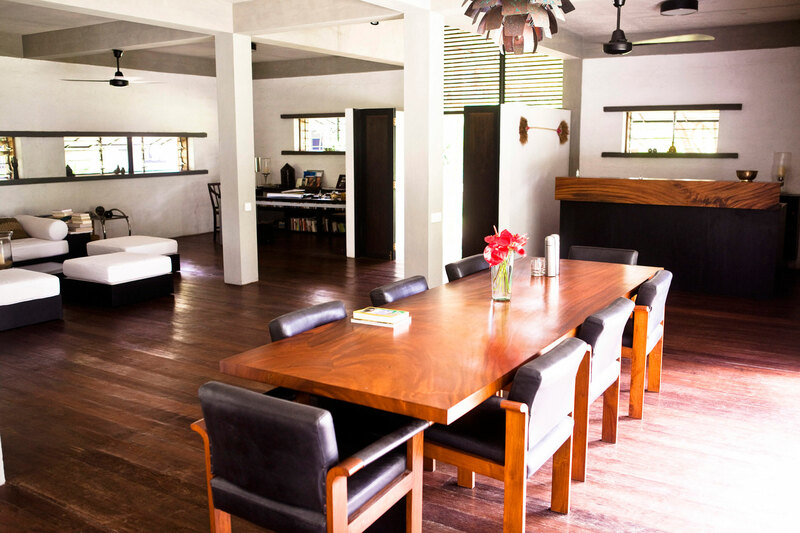 After arriving at Bandaranaike Airport north of Colombo, you will be met by our driver and chauffeured to the Ayurveda Guesthouse & Resort Bogenvillya. 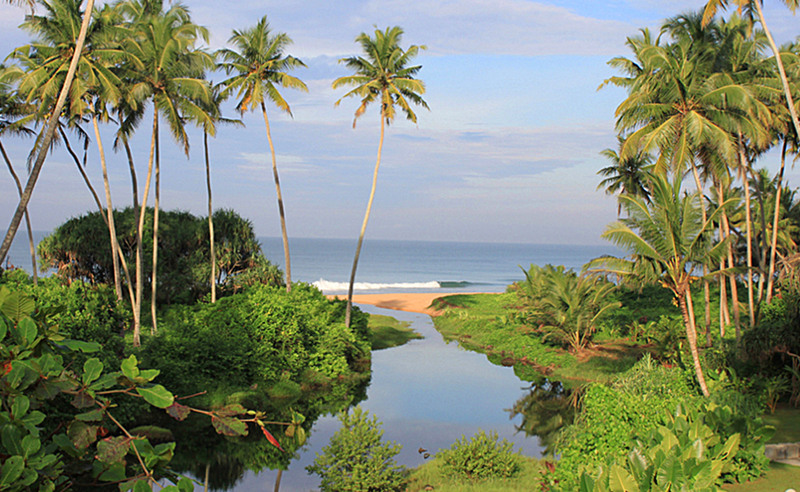 The drive takes almost two hours, partly through the capital Colombo as well as along the west coast. In addition to numerous flight connections with intermediate stops, such as in Dubai or Doha, there are now non-stop flights to Colombo from many European cities, which will shorten your travel time. 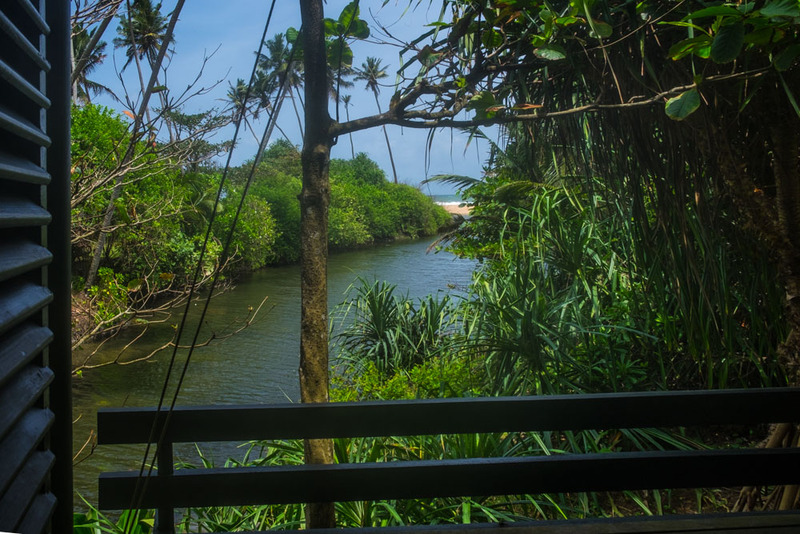 Ahungalla is located in the area influenced by the southwest monsoon, which brings moisture from the Indian Ocean between the middle of May and October. According to travel reports, the ideal period to travel to the southwest coast is therefore between November and April. During this time, the sea is calmer and there is usually little rainfall. 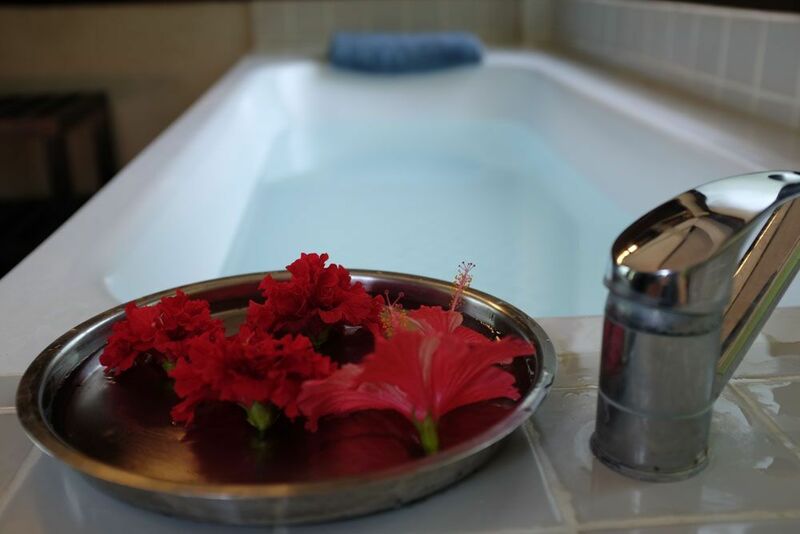 Due to the year-round warm temperatures, however, more and more guests prefer the off season for an Ayurvedic cure. In the off season, they will enjoy a special tranquility and the lush flora that blossoms through the varied, always warm weather. 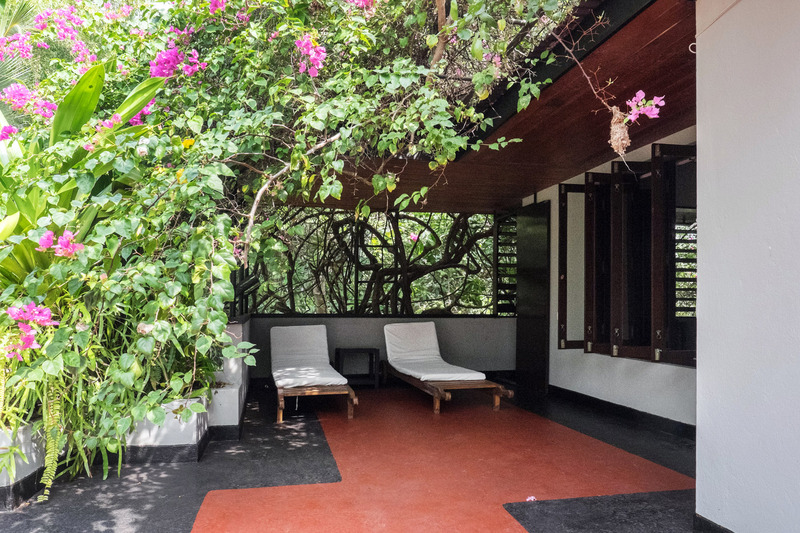 Built in the European-Sinhala style, the Ayurveda Guesthouse & Resort Bogenvillya extends over a spacious tropical garden and consists of both shared and private living areas, Ayurveda therapy rooms, and an undisturbed place for yoga and meditation. 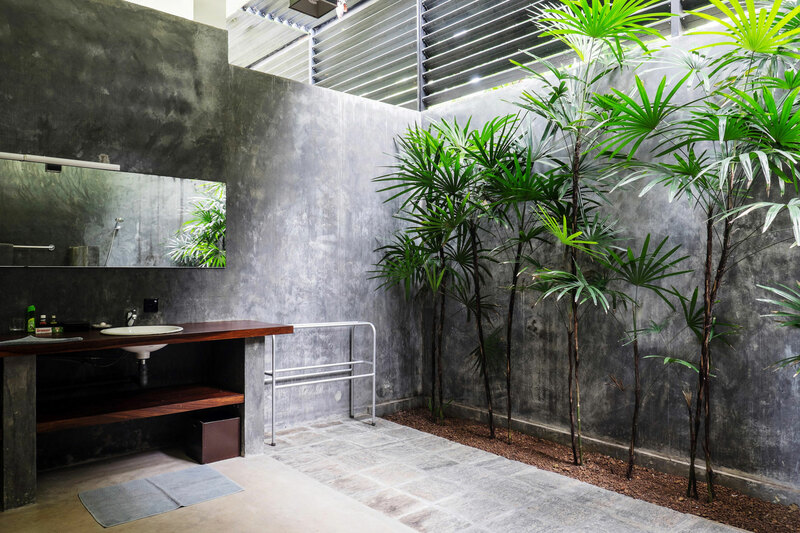 Our own well looked-after fresh water swimming pool (12 x 18m), surrounded by lush vegetation, can be used day and night thanks to underwater lighting. The main building, Bogenvillya, boasts terraces, a loggia and a salon with a library. 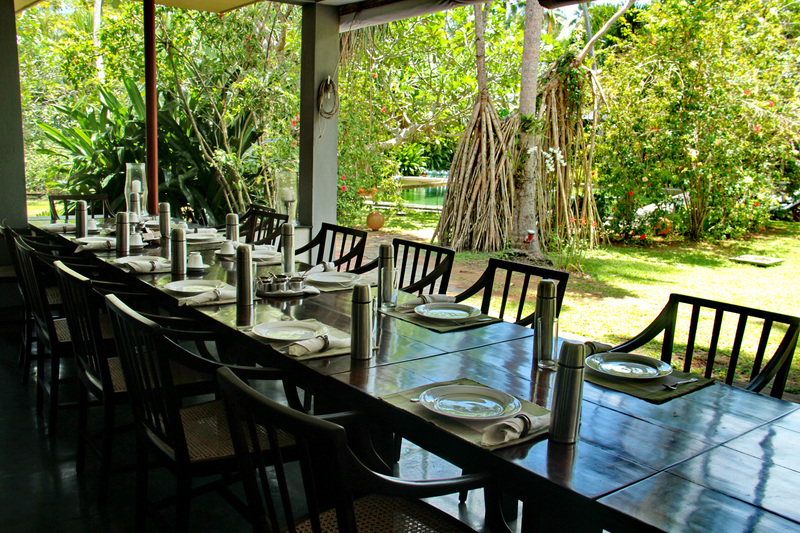 It offers the stylish ambiance perfect for inspirational encounters and for the meals taken together which, in addition to a varied breakfast, include a balanced lunch and dinner featuring local, mainly Ayurvedic dishes. 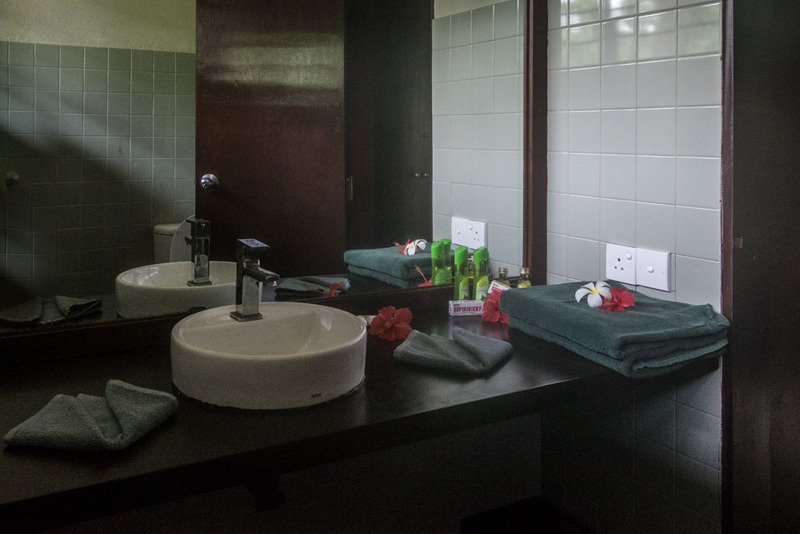 The modern and lovingly furnished rooms are located in the main building and in five adjoining bungalows, each offering individual living comfort. 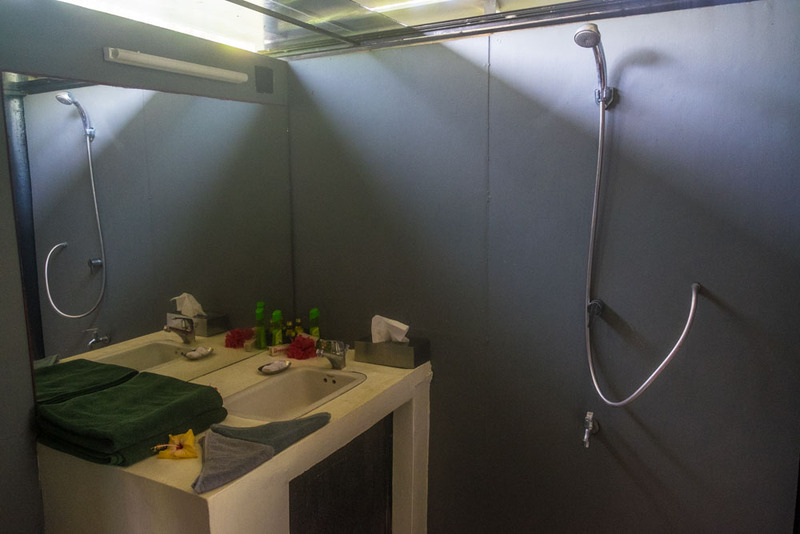 All of the 13 generously designed rooms are equipped with hot water, shower, WC, WLAN and a private lounge area. Like the resort itself, the main building bears the name “Bogenvillya”. 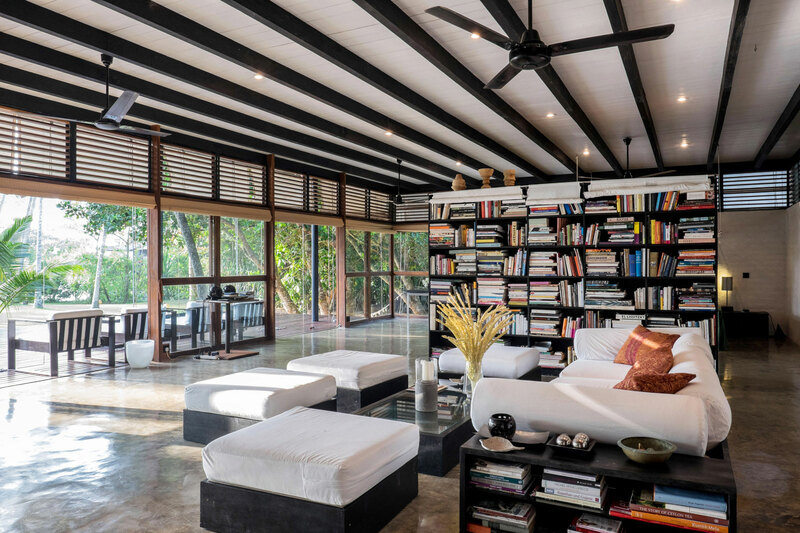 It has three rooms and comes as well with terraces, a loggia and a salon with a library. 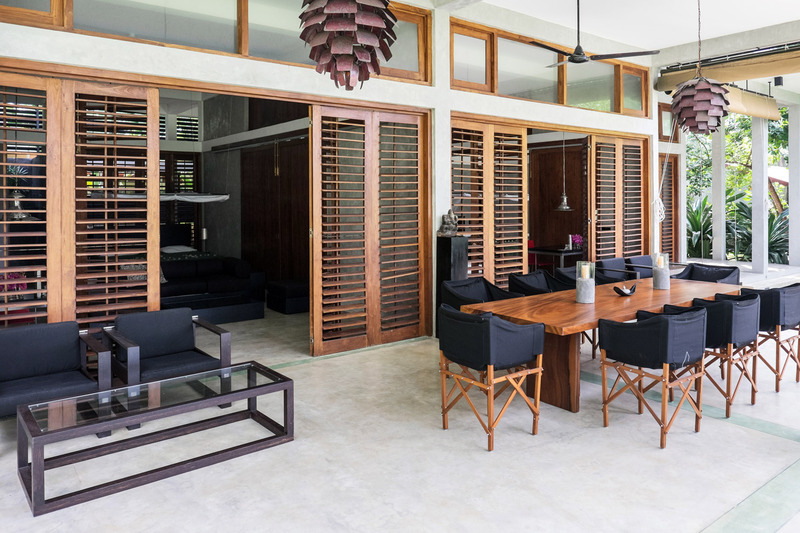 The terraces not only offer a fascinating view of the palm grove but are also an ideal private retreat for rest and relaxation. 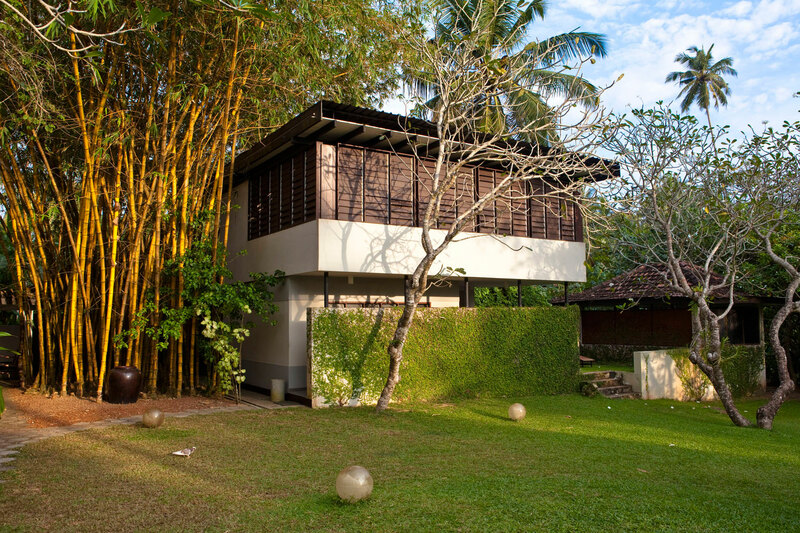 The Araliya Bungalow, designed by the architect Varuna de Silva from Colombo (Sri Lanka), is surrounded by palm trees and araliya trees (“temple flower trees”). 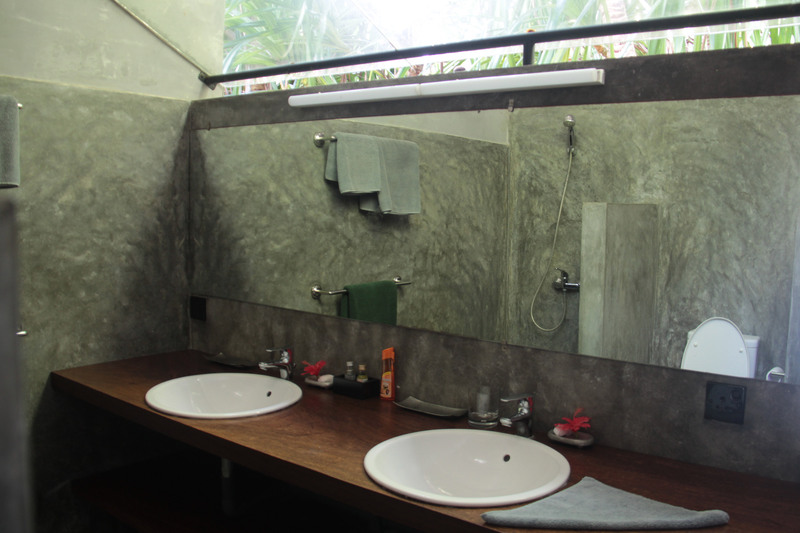 Its four rooms are separated from each other by sliding teak partitions, and all have a spacious bathroom with a shower and a pergola. 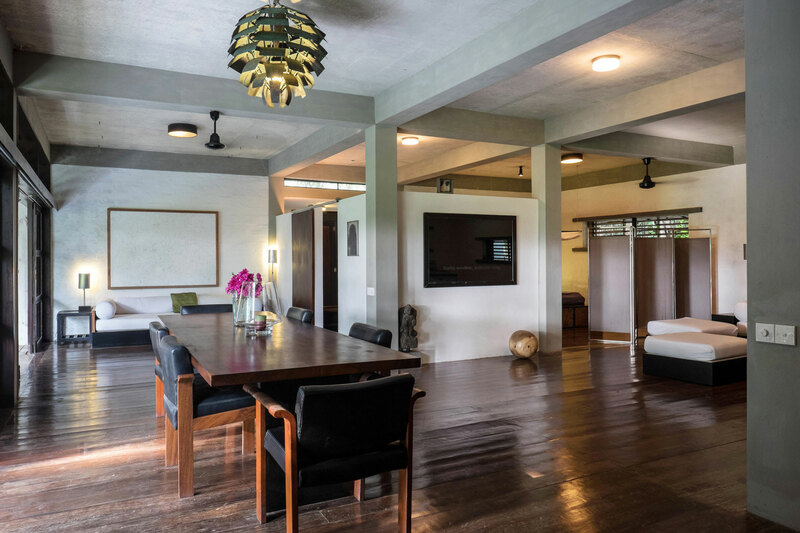 Thanks to the flexible way the space can be rearranged, this bungalow is particularly suitable for families. 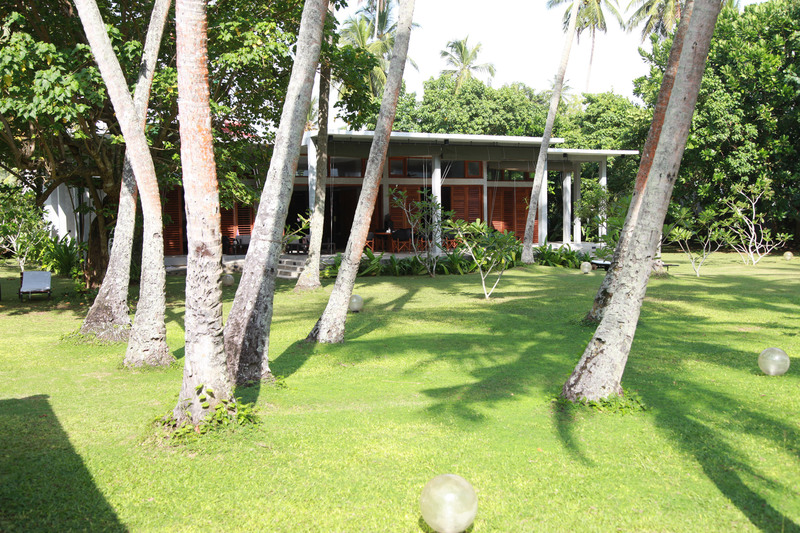 Next to the main building Bogenvillya is the Single-storey Bungalow. 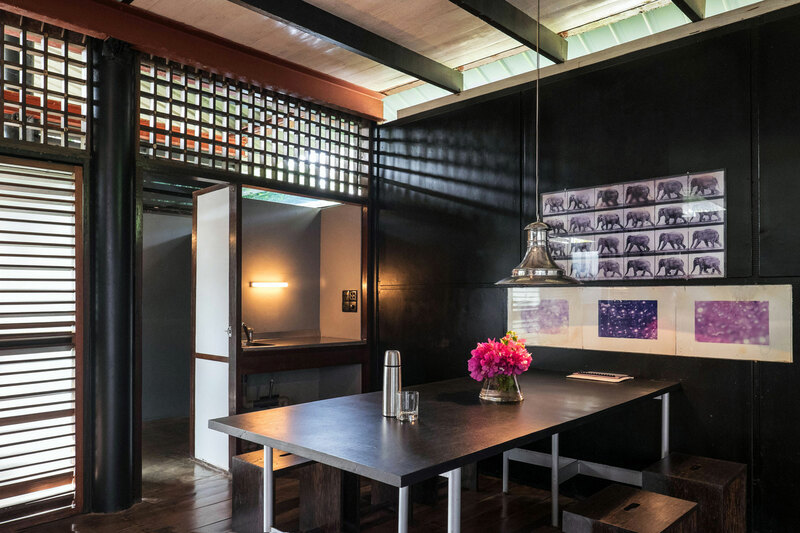 It has a spacious bedroom on the first floor, a living room or bedroom below, as well as a private interior courtyard. 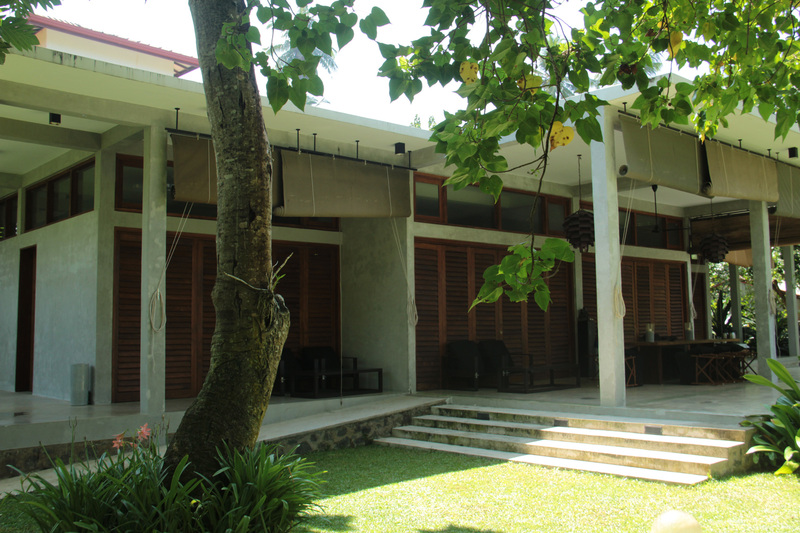 Thanks to its generous rooms, this bungalow is particularly suitable for families with children. 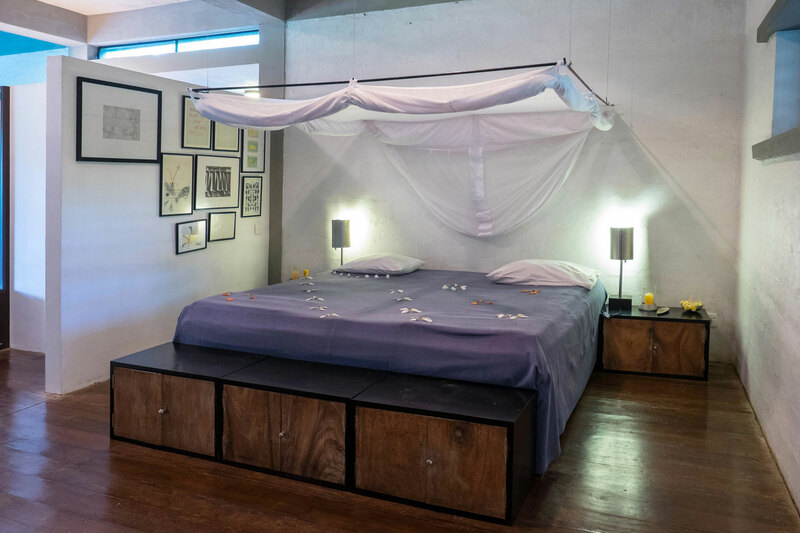 The Garden Loft comprises an extremely spacious room (about 140 m2) with open, comfortably furnished living areas. 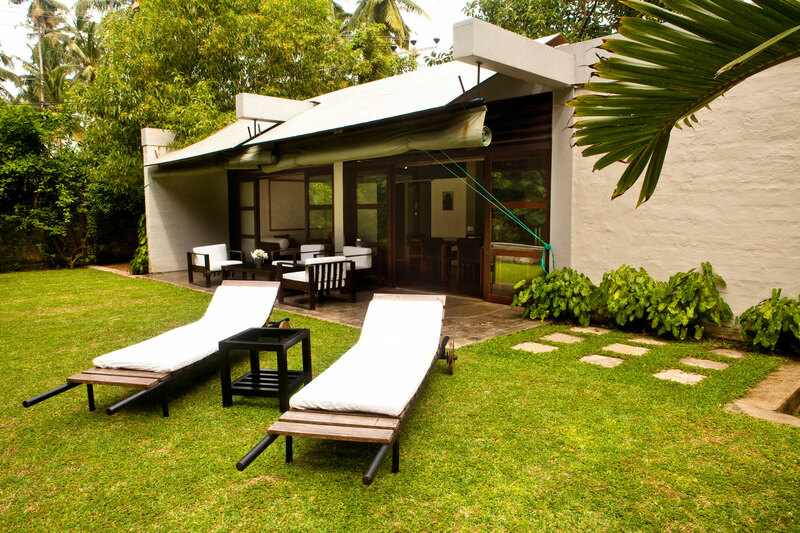 Its extensive terrace, with direct access to the palm grove, is the perfect place to linger a while and relax. 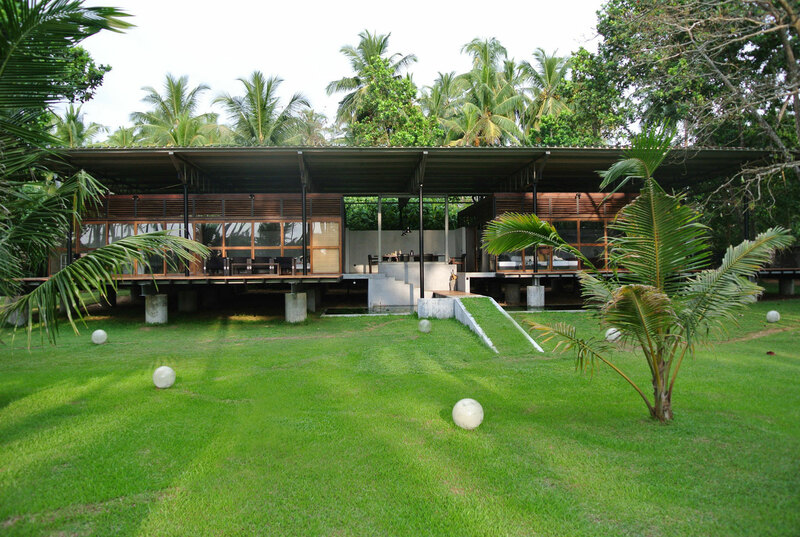 The Lagoon Bungalow, designed by architect Carl Pruscha, stands directly on the shore of the lagoon. 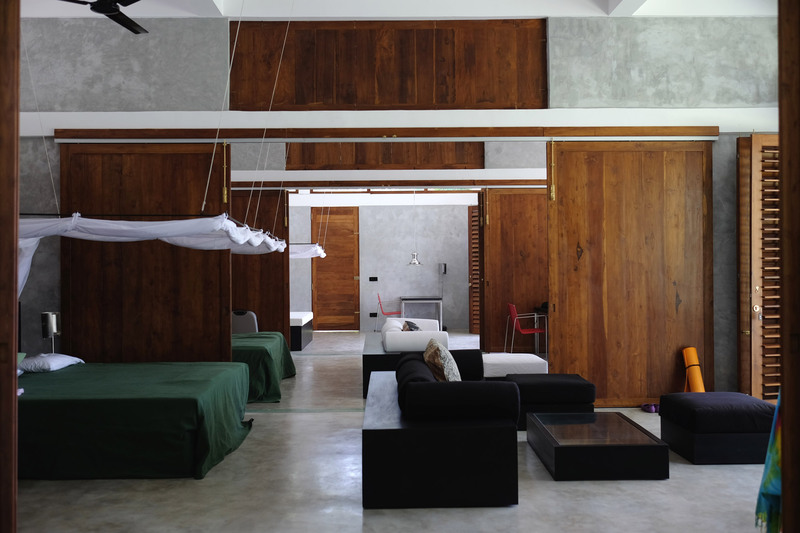 Based on a simple modular system of iron, wood and glass, three unpretentious transparent living units were created. 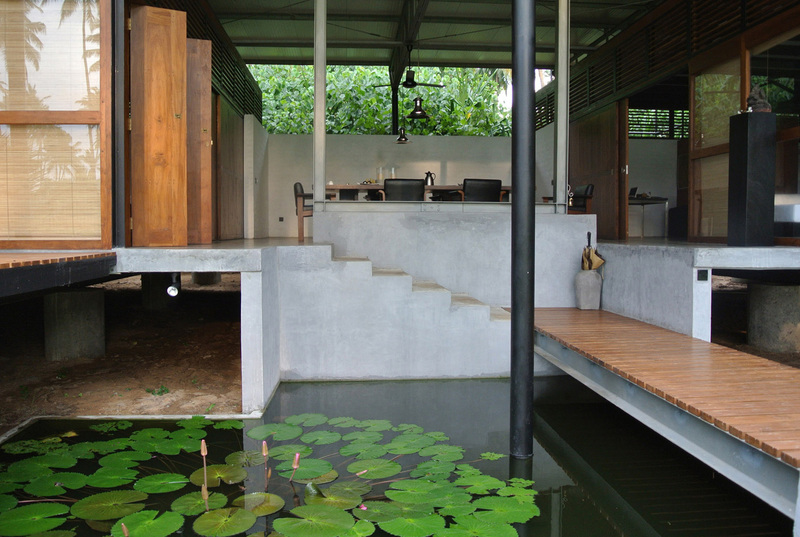 Each room in this pile dwelling has its own terrace overlooking the lagoon with its tropical vegetation and wildlife. Room no. 3 has a direct view of the sea. 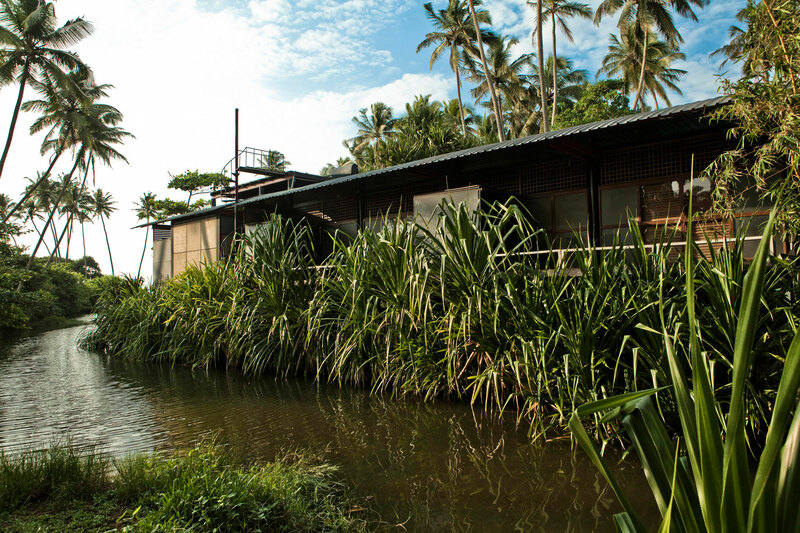 To get to the Palm Grove Bungalow, you pass over a small bridge over the lagoon that traverses the Bogenvillya. 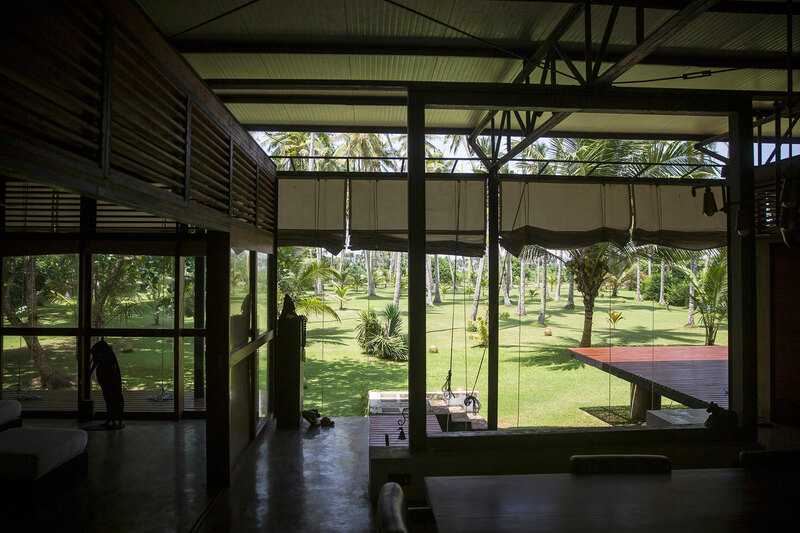 According to plans by architect Carl Pruscha, two generous, transparent living units were created, with partly covered terraces as well as direct access to the garden and the sea. 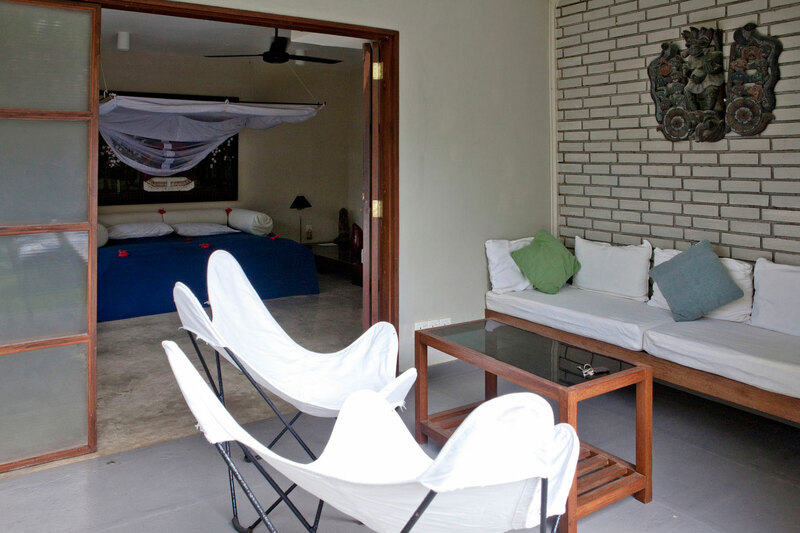 From this bungalow, you enjoy a beautiful view of the flora and fauna. These health-focused teachings, deeply rooted in India and its neighbouring countries for more than five thousand years, combine a number of healing and diagnostic procedures. As a holistic form of medicine, it has come to be promoted as a complementary medical method in Western countries as well. 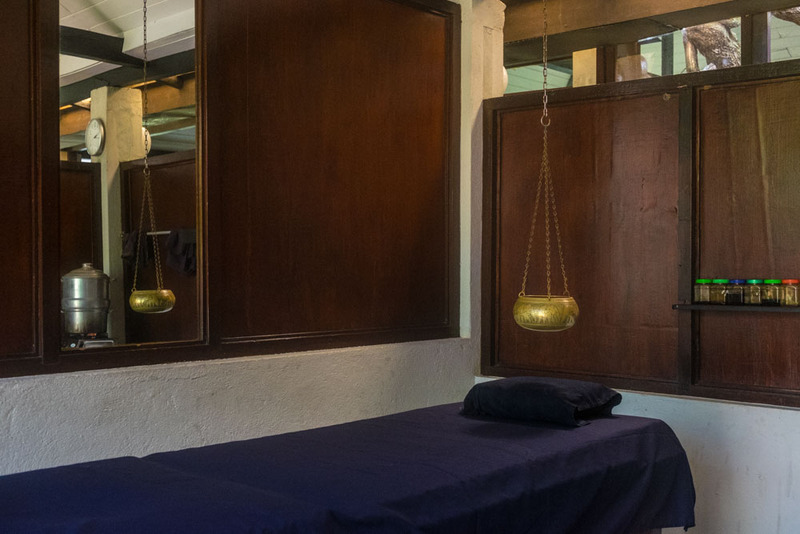 Ayurveda begins with the belief that the five elements – air, ether, fire, water and earth – make life possible and steer all our mental and physical processes. 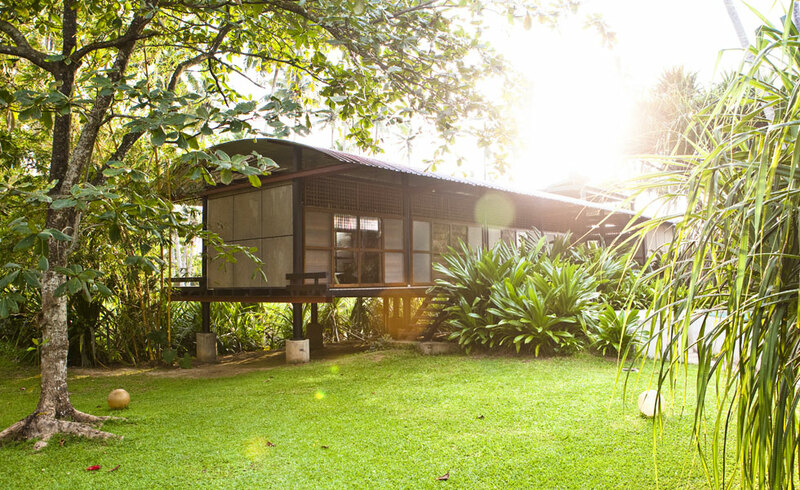 From this starting point, Ayurveda derives three bioenergies: air and ether form VATA; fire and a little water form the bioenergy PITTA; and earth and water form KAPHA. If these energies are not in harmony, it can lead to physical and mental afflictions. Ayurveda helps restore the needed balance. 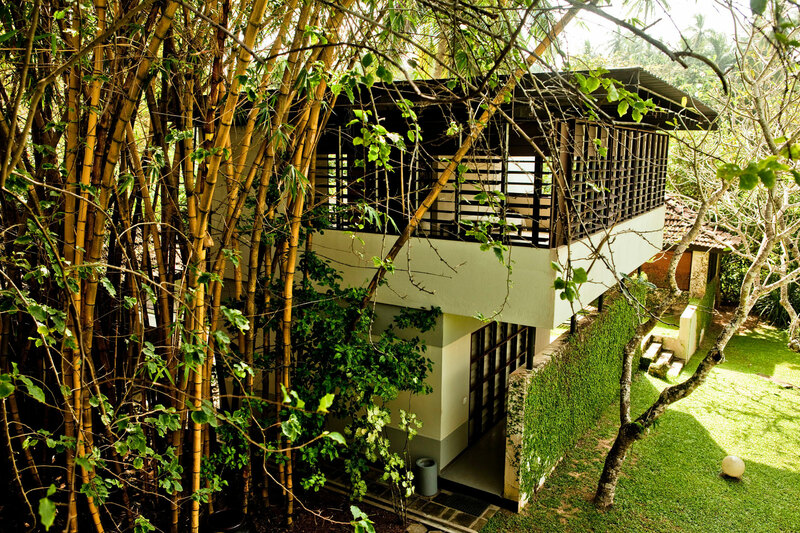 The ayurveda team at the Ayurveda Guesthouse & Resort Bogenvillya is headed by the experienced physician Dr. Janakee Perera. After her training as a school doctor, she occupied herself with the intensive study of the effects of medicinal herbs and their applications. 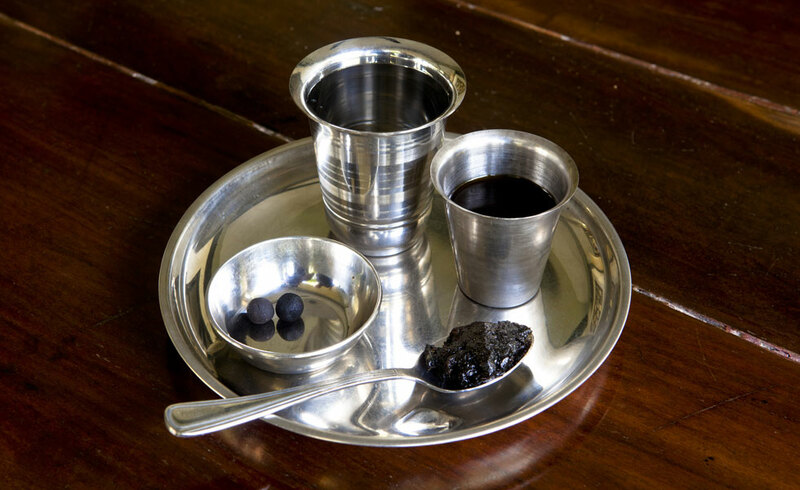 An Ayurveda practitioner who has been practicing for more than twenty years, she runs a clinic in Hikkaduwa with a staff of around 40 and, in parallel, a practice especially set up in the Bogenvillya, where she treats long-time patients with the same feeling for her craft as she treats those who have no prior experience with this particular healing method. Dr. Janakee Perera and her well-trained team of therapists look forward to your visit! 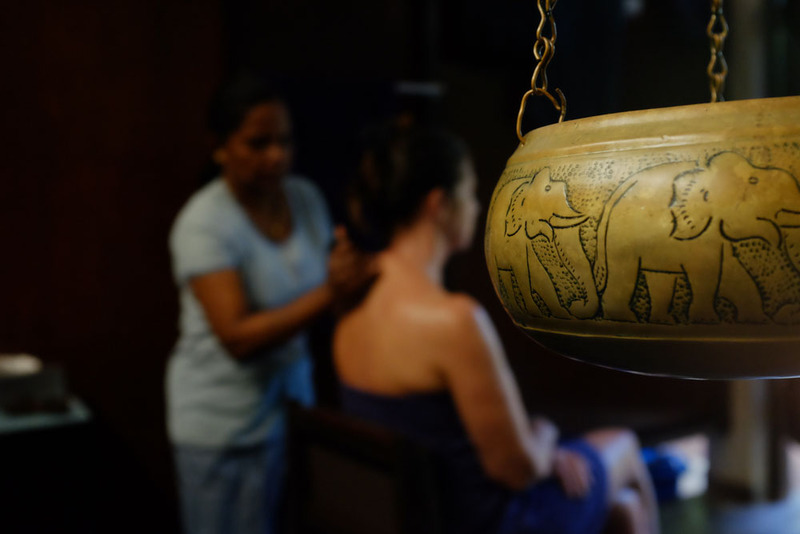 During your stay at the Ayurveda Guesthouse & Resort Bogenvillya, you can support and improve your physical and emotional well-being through individually coordinated Ayurveda treatments such as massages, oil treatments and compliance with certain nutritional rules. This is not focusing on the treatment of an illness, but rather on the individual with his or her own needs. The word “Rasayana” comes from the Sanskrit and means “rejuvenation”. This wellness cure aims to balance physical and psychological stresses and, depending on your constitution, can be applied over a period of a few days up to several weeks. 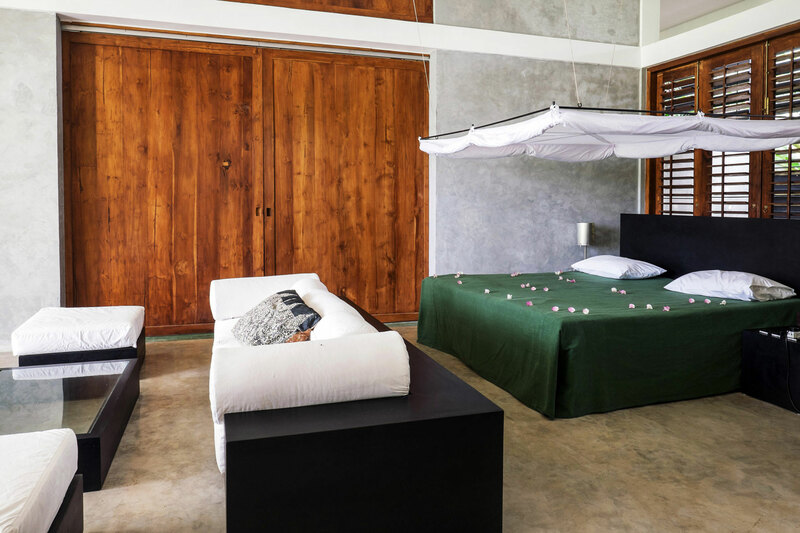 In addition to the wellness treatments, the possibility also exists to carry out a personal detoxification programme on site, under the supervision of the experienced physician Dr. Janakee Perera and her acomplished team of therapists. Since the cleansing process for the body involves a lengthy – and initially demanding – adjustment phase, a period of at least two weeks, and preferably three weeks, is recommended for such a cure. Over the course of the cure, you will benefit from regular consultations with Dr. Perera. 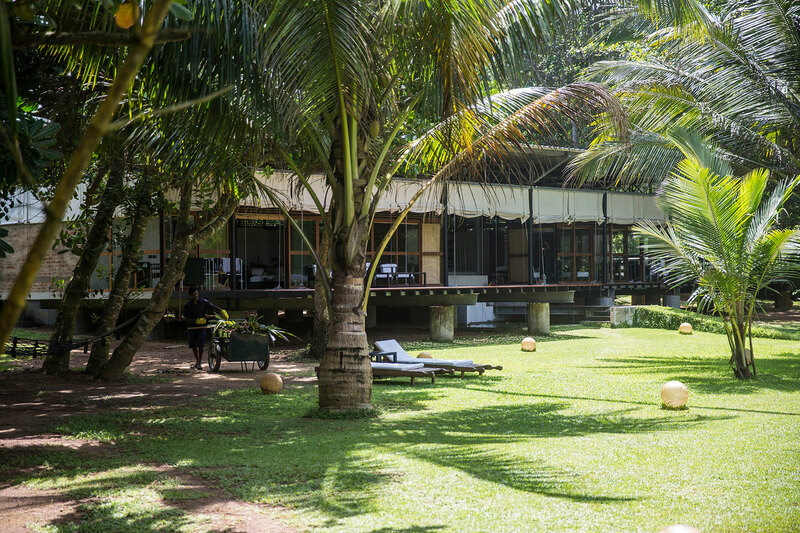 Every morning between seven and eight o’clock, our yoga teacher, Mr. Nuwan Dilanka de Silva, conducts an open lesson in the tropical garden of the Ayurveda Guesthouse & Resort Bogenvillya, overlooking the lagoon and open sea. In case of rain, the yoga class is moved into a covered building. 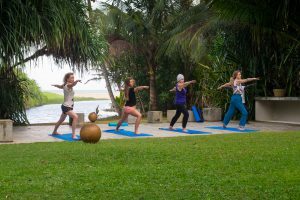 All guests are welcome – regardless of their level of yoga skill – and they are empathetically instructed and accompanied. On request, individual lessons can also be arranged. 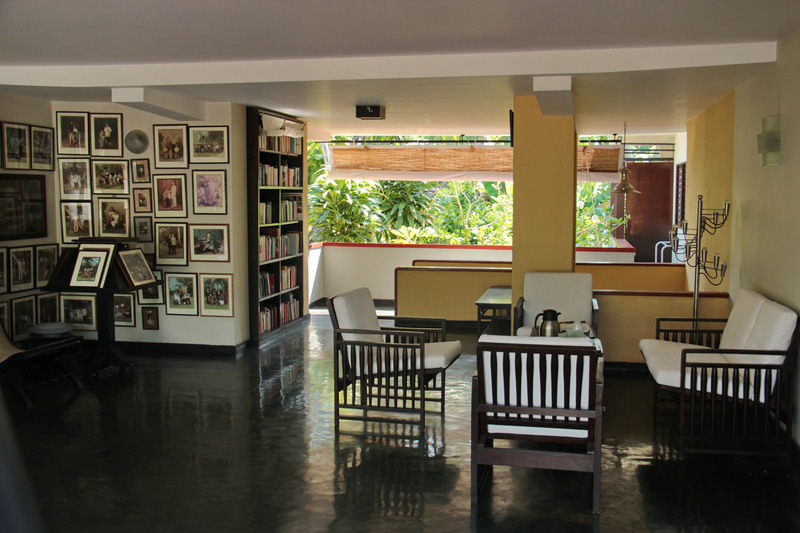 The Ayurveda Guesthouse & Resort Bogenvillya provides the ideal setting for carrying out yoga and literature seminars or workshops in an inspiring and unique environment. 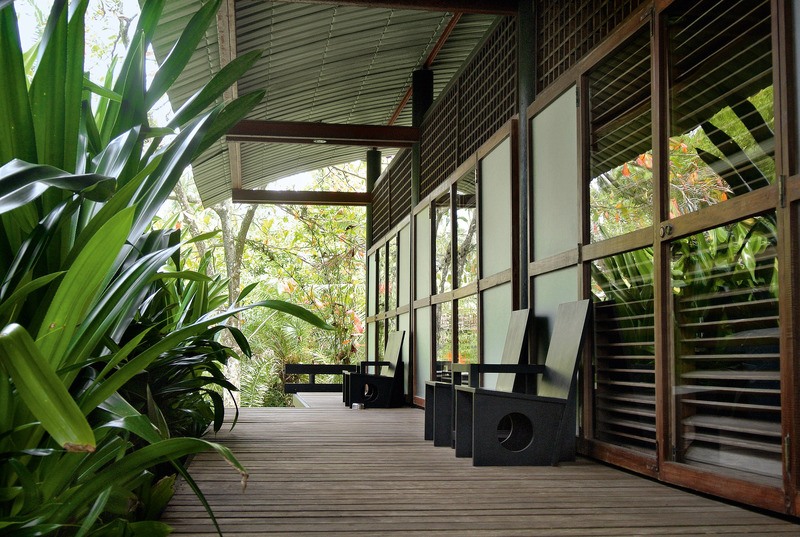 The classes and workshops can take place outdoors with a view of the lush garden and the lagoon, or indoors. 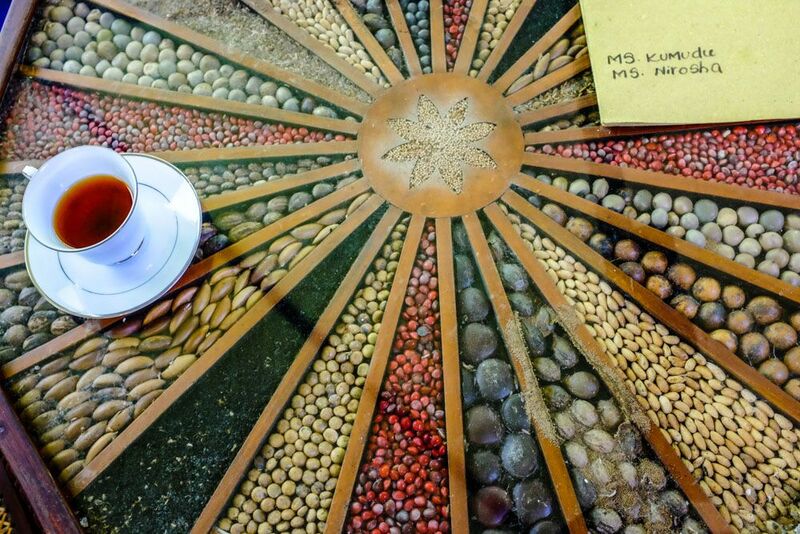 We kindly ask you to contact us directly, so that we can plan your stay with you. 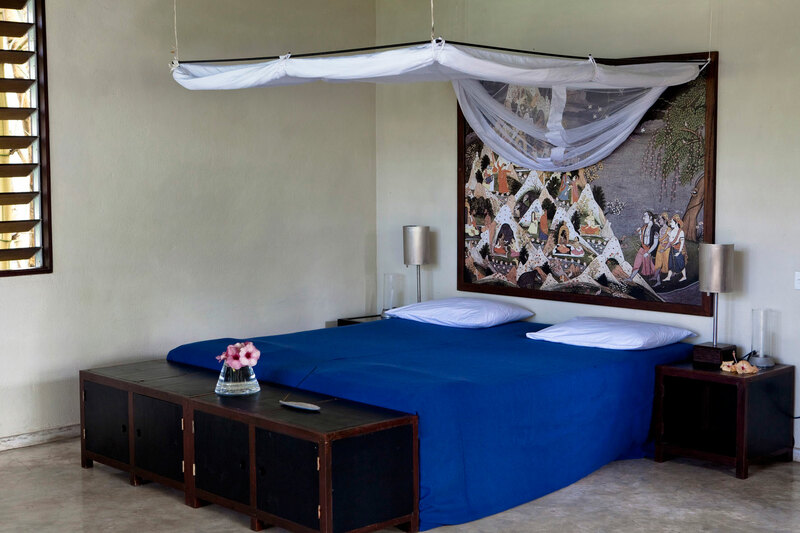 Room prices below are all inclusive, i.e. meals (full board), alcohol-free drinks, coffee & tea. For the festive dinners on 24, 25 and 26 December, as well as on New Year’s Eve and New Year’s Day, an extra charge of € 35.00 per person will be charged. In the case of all prices shown (room rates, Ayurveda cures, yoga classes), government taxes (VAT and NBT) totaling 17 percent are not included. 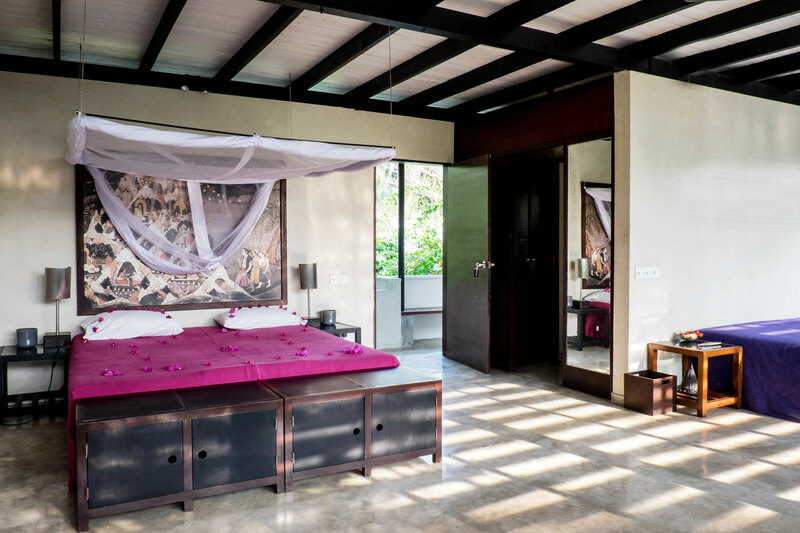 In the period from 1 April to 31 May, and from 1 September to 31 October, we grant guests staying at least 10 days, combined with an Ayurvedic cure, a discount of 10 percent on the room rate. 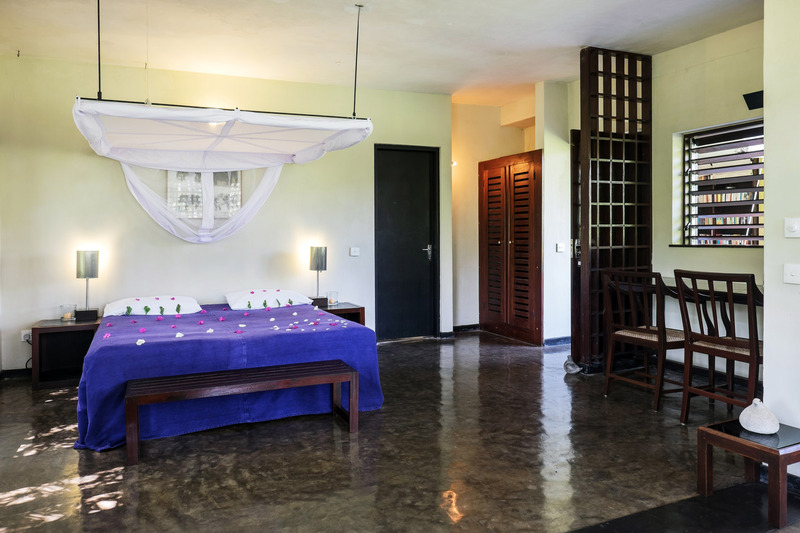 We will be pleased to receive your booking inquiry and learn of your desire to stay with us at the Ayurveda Guesthouse & Resort Bogenvillya. Your inquiry will be processed and answered as soon as possible.